Special Offer for all Teachers - EXTENDED!!! 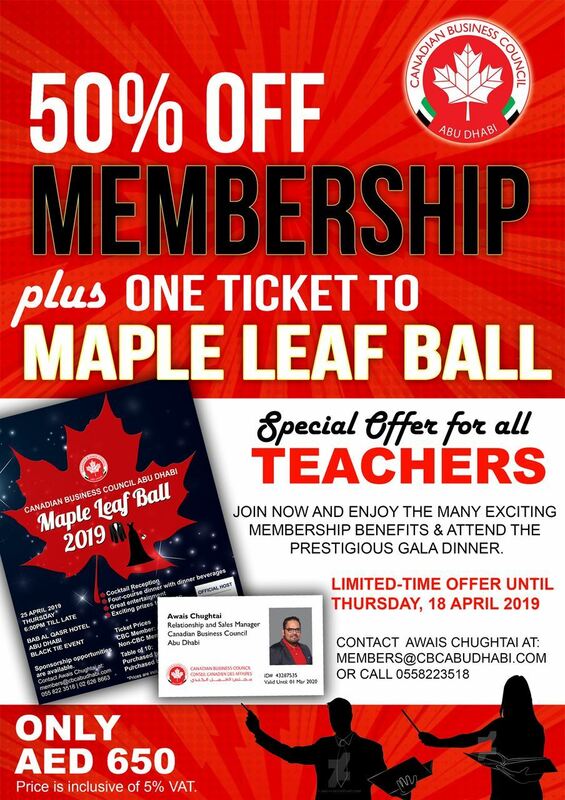 As part of our Youth & Education Communities of Interest (COI) initiative, the Canadian Business Council (CBC) Abu Dhabi is pleased to offer a very special price to all school teachers. This special price of AED 650 (net) includes one year CBC membership as well as one ticket to our Annual Gala Dinner taking place on Thursday, 25 April 2019 at Bab Al Qasr Hotel. This offer includes a 50% discount to our standard annual membership rate for the first year. The one year CBC membership will give you access to the many exciting member's benefits and discounts, and attendance at various events with free or privileged member rates. Our annual Maple Leaf Gala is attended by more than 200 people. Last year, it was a resounding success with a great Canadian band entertainment, exciting prizes and many more. Also this combo offer includes the member rate for the gala dinner. Please hurry and reserve your spot as this onetime offer is valid for all bookings paid by April 18, 2019. Contact Awais Chughtai at: members@cbcabudhabi.com or 0558223518. Thank you and we look forward to welcoming you to CBC and meeting you at our Maple Leaf Ball as well as to other events.